For your next corporate outing, take your employees outside for some fresh air and an invigorating game of Ping Pong. Play for fun—we can offer instruction. 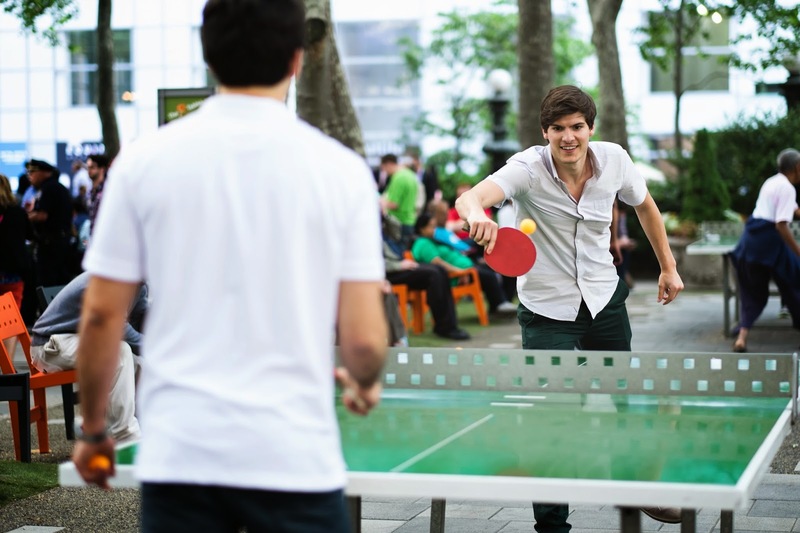 Or, set up an intra-office tournament with styles ranging from singles matches, to mixed doubles, to round robins. Maybe Around the World-style is a better fit, to get the whole group involved? Whatever way you choose to play, a party at The Tables is a great way to build team spirit. Contact Maureen Devenny for planning and pricing your Ping Pong Party, and be sure to check out the Basic Party Package below. Ping Pong at The Tables is a company outing to remember. If you’d like refreshments, we’re happy to connect you to our excellent onsite food kiosks. Afterward, celebrate with drinks and no-wait entry at Manhattan’s hottest after-work scenes, the Bryant Park Café and Southwest Porch.